J&P Cycles 36th Anniversary Open House. June 27-28 In A New Location. Published by Cyril Huze April 28th, 2015	in Editorial and Events. J&P Cycles is experiencing growing pains. The 36th annual J&P Cycles Open House Rally, scheduled for June 27-28, is being moved to a different location than the usual J&P headquarters. This year, the rally is moving to the Jones County Fairgrounds, located in Monticello, Iowa, just 10 miles north of Anamosa. The size of the event is the main reason for the move as it has grown tremendously over the years. A concert held on the grounds last year was a great addition, and one that takes up even more room. 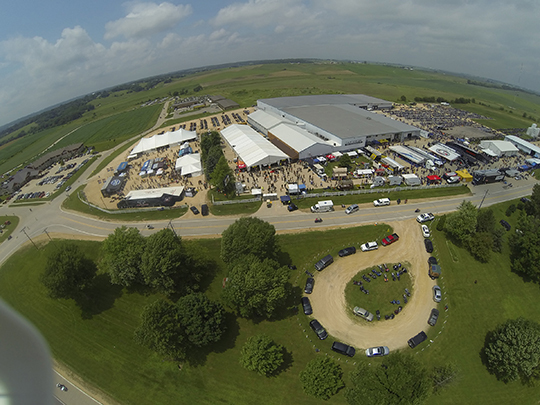 The Jones County Fairgrounds is used to hosting large events – it’s the venue for one of the largest county fairs in the state of Iowa. With a built-in stage, spacious grounds and indoor space galore, it is the perfect fit. Concerts will be a feature of this year’s event, too. A free concert on Sunday, June 28, will feature the rock band, Great White. Hit songs include Once Bitten Twice Shy, Rock Me, Save Your Love and House of Broken Love, to name a few. The line-up for Saturday’s live music will be announced soon. In addition to concerts, visitors can see Cowboy Kenny’s Steel Rodeo, an action packed freestyle motorcycle exhibition that features high-in-the air acrobatic and daredevil style jumps as well as other stunt riding. Cowboy Kenny’s Steel Rodeo will perform at various times throughout both Saturday and Sunday. This family-friendly event will also feature special entertainment just for children. And, let’s not forget the motorcycle parts, gear and apparel! Those attending will get to see the latest motorcycle wares from some of the biggest names in the industry. More than 100 motorcycle manufacturers will be on site. More than 35,000 visitors attended the 35th annual event last year, including folks from Canada, Pennsylvania, Colorado, Florida and West Virginia, to name a few. The J&P Cycles Open House Rally started as a small Customer Appreciation Day held by co-founders John and Jill Parham to thank their customers for their business throughout the year. Now, as the world’s largest aftermarket retailer of parts and accessories for Harley-Davidson and V-Twin Cruiser motorcycles, the event is a full blown rally, and outside of Sturgis, is one of the only places in the Midwest to see this many motorcycle manufacturers and riders in one area. Which version of Great White ? Blackmax…If you haven’t already looked into it try looking for rooms in Cedar Rapids…it’s a nice 30 minute ride (at least it was to the previous location). See it DOES pay to be on Cyril’s blog !!!! !